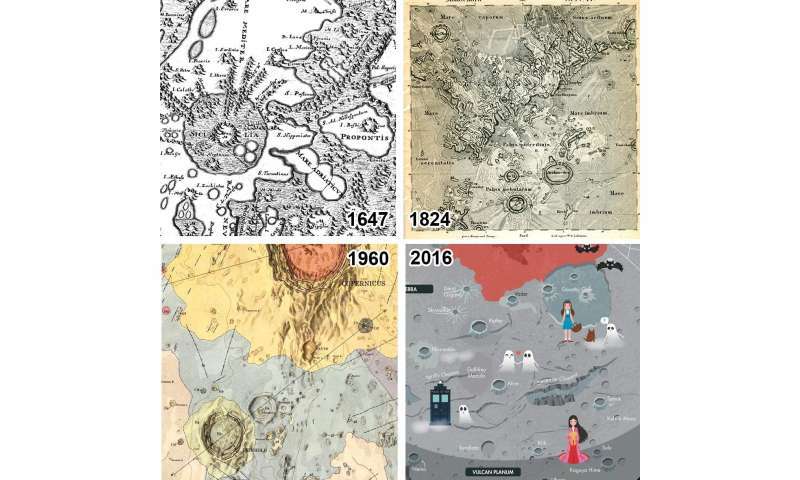 A catalogue that provides an overview of over 2,200 planetary maps produced worldwide between 1600 and 2018 has been presented today at the European Planetary Science Congress (EPSC) 2018 in Berlin. The catalogue has been produced by Henrik Hargitai, from Eötvös Loránd University in Budapest (Hungary), and Mateusz Pitura, from the University of Wroclaw (Poland). "Production of planetary maps started in Europe in the 1600s. It expanded to the United States and the Soviet Union in the 1960s and, more recently, has spread to China and Japan," said Hargitai. "Over time, mapping has become less coordinated and more diverse, so that today it is becoming challenging to oversee the proliferation of spatial data published in different countries by institutions, individual researchers and, increasingly, citizen scientists. A common database is needed." To provide this definitive overview, Hargitai and Pitura have created the open access "International Catalogue of Planetary Maps", available at planetarymapping.org and through the International Cartographic Association's Commission on Planetary Cartography. The data can be filtered by author, year, country, scale, type and reveal long-term trends in planetary mapping and planetary science activities. Recent web-based map services, such as MoonTrek by NASA/JPL/Caltech or OpenPlanetaryMap's vector basemap of Mars are organised into layers so that the user can view and analyse planetary surfaces in detail with Geographic Information System (GIS) tools. Most of the maps in the catalogue present Mars (40% of all maps) and the Moon (46%) whereas mapping of Venus (5%), Mercury (2%) and the Jovian moons (4%) has produced many less examples. Around 20% of all maps are geologic maps that represent the most complex planetary cartographic analysis. "Our catalogue is being updated regularly with both newly resurfaced historic maps and new additions. For the future, we plan to add maps that have been published in journal articles and digitise maps that do not yet include GIS formats," added Hargitai. "We live in a transition period where static maps that characterised the last 400 years may become extinct, replaced by dynamic digital map services and tools. In the digital platforms it is becoming difficult even to define what we consider to be a "map", and not just layers of spatial data. Maps are used for mission planning, surface operation, and post-mission analysis. In the near future, they will be key components of planning and operating new human missions."